In a fantasy world, I would have a ton of extra cash to spend on fancy meals out at all my favorite restaurants. But honestly, even if I did, I think I would still enjoy a night of cooking at home with my friends and family. This past weekend I was in the mood for something gourmet, but was also in the mood to cook. So we tried something new - a fantastic recipe that is perfect for a dinner with your parents at your place, a date night, or a fun dinner party with a few close friends. The risotto is so fun to make, because it expands out with all the liquids into this sumptuous fluffy texture, and the parmesan transforms it into a gooey comfort food. 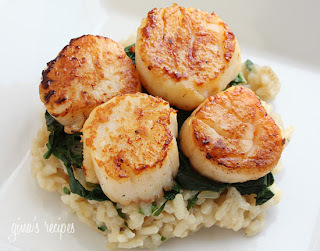 Add scallops and sauteed spinach (two of my favorite things), plus a glass of wine or two, and this meal becomes an easy "gourmet" meal that you could even cook on a Monday instead of a Sunday - it only took 25 minutes! In a medium size heavy sauce pan, add butter on medium-low heat. Add shallots, sauté about 1 minute. Add rice, mixing well until well coated and transluscent, about 2 minutes. Add wine, salt and pepper and mix well until it is absorbed into the rice. Ladle 1 cup stock into rice and mix until all stock is absorbed, add another ladle, and continue adding and stirring until all broth is absorbed, about 20-25 minutes. Add parmesan cheese and parsley, mix well and serve. Wash scallops (pull off feet if present) and pat dry with a paper towel. Season with salt and pepper. Melt butter in a large hot pan, and place scallops in the pan. Sear without touching them for a few minutes until the bottom forms a nice caramel colored crust. Turn over and cook about another minute or 2, until the center is slightly translucent (you can check this by viewing them from the side) and the bottom is seared. Remove from the pan and set aside. It looks fabulous and easy. Thanks for sharing!